Purists (like perhaps my sister D., a Greek scholar?) will say this is not souvlaki, because it’s not on skewers. I say, I don’t care what it is, it’s really good. You can use skewers if it assuages your feelings in any way, but I’m foregoing them here because we’re going for a throw-it-in-the-oven sort of cold weather affair, not a turn-it-on-the-grill summertime thing. Wrap the grated cucumber in a clean tea towel and squeeze well to remove the moisture. In a large bowl, combine the cucumber with the yogurt, garlic, olive oil, dill, salt, and pepper. Measure out 2 1/2 cups of the sauce and set aside for serving. To the remaining sauce, add the red wine vinegar and oregano and stir well to create a marinade. Pour half of the marinade over the chicken. In a large container or zip-top bag, combine the butternut squash, grape tomatoes and bell pepper. Coat the vegetables with the other half of the marinade. Place both the chicken and the vegetable mixture in the refrigerator and marinate for a minimum of 2 hours and up to 24 (I prefer the longer marinating time). Preheat oven to 400 degrees. Remove the chicken from the marinade and place in a single layer on a baking sheet. Remove the vegetables from the marinade and place in a single layer on a second baking sheet. Wrap the sliced beets in foil (to help them steam and to prevent the color from bleeding into the other vegetables) and place the foil packet on the tray with the vegetables. Roast the chicken and vegetables at 400 degrees for 25-30 minutes, until the chicken is cooked through and the butternut squash is fork-tender. 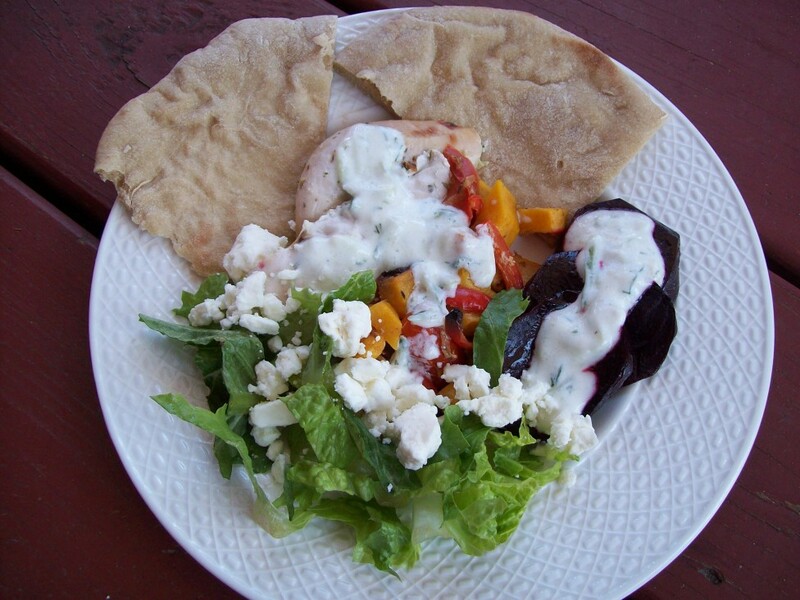 Serve the chicken, vegetable mixture, and beets with warm pita bread, lemon segments for squeezing over the top, the shredded lettuce, feta cheese, and the reserved tzatziki sauce.